SPEA1 has buttons for Percent and Type Selections. SPEA1 provides the facility to view harmonics upto 55th Level, for both Voltage and Current. Normally, you will require odd harmonics only, so you can see 3rd, 5th…..55th Harmonic. If you require even harmonics also, you can set SPEA-1 for this using menu options. The Menu explained here allows you to see individual harmonics , both as Value and Percentage. The Image above shows a 0.5W LED bulb being tested. 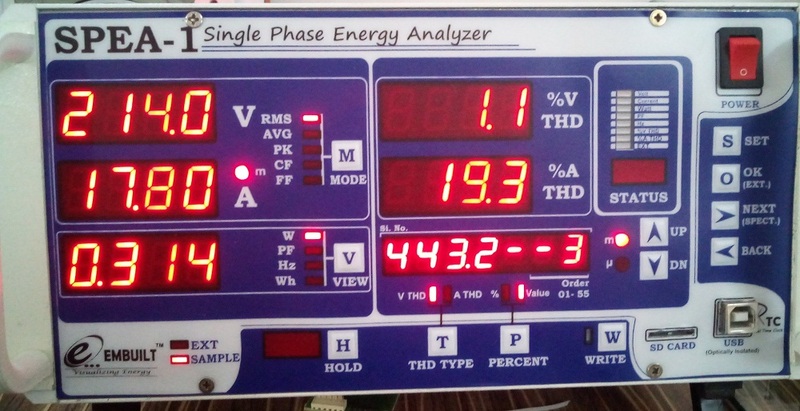 The Sixth Display is showing the Voltage THD of the Third Harmonic, as Absolute Volue. It is now showing the RMS value of Volt/Amps and Wattage on the first column. It is showing the %V THD and %A THD in the 4th and 5th display respectively. It is showing 443.2mV as absolute value of Voltage Thrird Harmonic. Note the 'm' led is lighted up in this case, just on the left of UP button. We would like to see the third Harmonic as Percentage terms. Now it is showing the Voltage Third Harmonic as %. the 'm' LED is lighted up, just on the left of the UP button. If you want to see other harmonics, you can press the UP/Down button for 3rd,5th…55th harmonic one by one. To get the full Harmonic spectrum, you can press the NEXT[SPECT] button. Since it is not possible to see all the 55 or so values on SPEA-1, you can import this using USB port to your computer and generate a pdf report.